Change Font Color in Excel VBA - ANALYSISTABS - Innovating Awesome Tools for Data Analysis! We usually change the font color if we want to highlight some text. 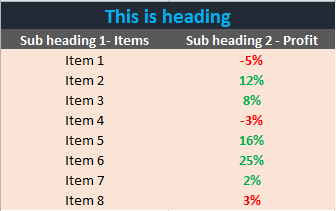 If we want to tell the importance of some data, we highlight the text to get the user attention to a particular range in the worksheet. For examples we can change the font color of highly positive figures in to Green or all negative figures in to red color. So that user can easily notice that and understand the data. We can change the font color by using Font.ColorIndex OR Font.Color Properties of a Range/Cell. The following examples will show you how to change the font color in Excel using VBA. We can change the font color while working with the reports. But it is good practice to limit to only few colors, instead of using many colors in a single report. In also need to mantian the same color format while delivering the same kind of report next time. 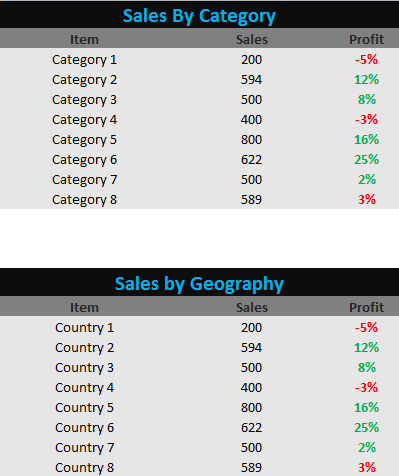 See the following example screen-shot, we are using the same font and background colors for in ranges in the worksheet. It looks good with same king of colors, instead of using multiple colors. I can trying the same code .. but i can’t see any changes in Excel sheet… and also Not throw any Error Messge … What can i do for this…? No Problem…. Code is Working Perfectly…. i can trying the same code…….but it shows an error is “object varible not set..” what can i do for this..?